This was the second tape of solo material I did in college. It's really awful, but it has its moments. Two thirds of the material is covers taken nearly verbatim from the songbooks I had at the time (notice the number of Beatles, Pink Floyd, Who, Led Zeppelin, and CSNY tracks). Half of the originals were also instrumental rip-offs of stuff I had heard at some point. Still, I like my takes on "19", "I Feel Fine", "Rock n Roll Suicide", and "Mother". The originals "Lakebird" and "The Songs I Sing" aren't bad, either. The title is one of my typical multiple meaning twists. This tape was no more "live" than any of the other ones. 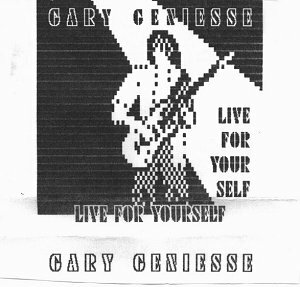 The tape also had a cool cover I created using Print Shop on my Apple IIe at the time.